It was a busy month when Royal Enfield called. Srini travelled to Jaipur for the SX4 drive and then to Verona for the A5, Bijoy was off to Istanbul to drive the Fiat Linea and Shumi went to Taiwan, to eat some faux non-veg food. Of course, all of those were going to be fun, but somehow the Royal Enfield ride was what everyone was eyeing. After all, it was going to be to BSM's other home, Goa. Now, I'd love to tell you that I sat back on a beach chair, sipped on Kings – Goa's world-famous (and cheapest) bottle of the good stuff – watching the sun set, thinking of what a great ride I had down the NH17 on a Royal Enfield and what not, but unfortunately I can't. The ride schedule just didn't permit it. So while Srini stayed at some snooty hotel, Bijoy drove on some fabulous roads in Turkey and Shumi visited Taipei 101, the tallest building in the world, I was laughed at by everyone at work because I slept in a king sized bed at the Marriot and was packed off to the airport at 5 am. I'm a loser. I went to Goa and all I did was miss the sunset and the cheap Kings beer. But look at the brighter side if you will, because I rode there on a Royal Enfield Bullet Machismo 500. It's been five years since a new product rolled out of Tiruvottiyur. 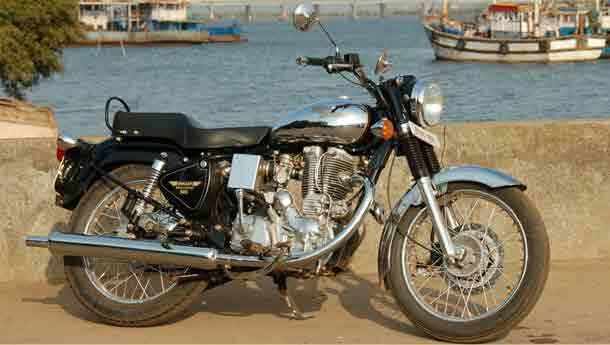 The Machismo 500 is not an engine format that Royal Enfield has just developed. They've been selling motorcycles with this engine to the UK for over two years now and the first time I spotted it was back in 2004, when Royal Enfield's marketing consultant Sachin Chavan rode it on the Road to Peace ride. Me and a few enthusiasts briefly stole the bike and rode it around the parking lot before Sachin arrived on the scene and reprimanded the guilty parties. In short, it's been the motorcycle that I and almost every other Royal Enfield fan were looking forward to. For the ride, Royal Enfield had organised five motorcycles, all of which were in the Machismo styling (RE won't be plugging in this engine onto any of their other variants.) Two of these had the big windscreens that you can buy as an option, but there was a unanimous decision that the windscreens be knocked off and so they were before the ride began. RE has also introduced a few changes to the motorcycle in terms of design with this 500cc model. The big chunky rubber footpegs have now been replaced by flatter pieces that are slash cut at the edges, so you no longer leave rubber beads at the apex during an intense corner carving session. The round Thunderbird style tail light now sits squarely on the Machismo rear tailpiece, which adds a nice retro touch to the motorcycle. Other than those two changes and a gold 500 decal on the toolbox, the motorcycle looks exactly like the 350cc Machismo. Fret not, because the engine in this frame is the 500cc lean-burn AVL that most of you Bullet enthusiasts have being waiting for. The bikes that we got had merely 35 km on the clock and we were briefed to take it easy for the first few hundred kilometres. Sachin Chavan, the ride coordinator, warned that there were no spare engine blocks and pistons in the backup van, as they have on other rides. This 500cc engine is rated to produce 23.65 bhp@5600 rpm, which is 5 bhp over the 350cc unit and the difference is quite evident especially out on the highway. The first hundred odd kilometres went by really quickly and by the 200 km mark, the engine started to free itself up. The muted thump got a little louder and the engine revved out much easier than when we started the ride. Everybody in the six member pack by now was maintaining average speeds of about 100 kph, and the motorcycle was doing all of this without any fuss. Overtaking on the two-lane NH17 was also effortless, as the 4.08 kgm of torque which is available at 3000 rpm helped lug the motorcycle from 40 kph all the way to 120 while the five-speeder was slotted on top. All said, 500cc from a single means quite a big bore and so it is naturally accompanied by the vibes and harshness that big thumpers bring with them, but none that you can't live with. I must add that NVH levels are definitely a few notches down from the older cast iron 500cc engine. Even the engine thump has been silenced to adhere to our stringent pollution and sound norms. The ride was a two day affair and the night's halt was at Ganpatiphule, a popular yet out of the way tourist resort that's just off the NH17. The place is about 30 km off the highway at the far end of SH60. This road is a definite highly-recommend to every motorcyclist and is the place where I decided to take the Machismo to the limit, or somewhere close. RE has made no changes to the chassis and so the Machismo hasn't really improved drastically in the handling department. The British Avon tyres, though, were a lot better than the MRFs that the Machismo will have here in India. So if I did buy a Machismo 500, the first thing I'd do would be to look for better rubber. The slash cut rubber footpegs were also something I liked because when I was dragging the pegs around corners, it left a cool trail of sparks behind me. Endurance gas-filled shock absorbers precisely damp the rear for a comfortable ride and the rest of the package is pretty much the same as what Royal Enfield have been offering over the last couple of years. We pulled in to Goa with just enough time to get a few photographs against the Goan landscape, after which we met up with RE's head RL Ravichadran. New engines on the existing platform is what his vision is for the brand – that and quality. Royal Enfield, he says, have gone back to the drawing board to better their quality levels and while they're at it they'll also launch a couple of models by the year end. As for this Machismo 500, all of the motorcycles in the fleet had no quality issues that I could complain about and held up in the reliability department as well. A good start, then? But add to that a price tag of approximately Rs 1.05 lakh and it might be a whole new ball game. Still, a Bullet after all is a Bullet and exorbitant price tags are just another part of the ownership experience. Is this the most expensive motorcycle in India? Is it worth that much money? That question isn't fair. Our experience tells us that 500 buyers are 500 buyers, they won't let something like price stop them. Question is, are you one of the them? It really has no competition?